Australians tend to underestimate the likelihood of things potentially going wrong in their lives.² Have you ever heard someone say “I will be able to repay this loan provided I keep my job, provided I don’t get sick in the next three years, provided my spouse doesn’t quit work and provided I don’t need major car repairs”? Chances are you probably have. Imagine that each of these four misfortunes has a probability of only 20 percent. What is the probability that none will occur? In fact, the probability of none of them occurring is only about 40 percent.³ However, most people would guess a far higher probability of plain sailing. Would you borrow if you knew that the chances of you being able to service the loan are only 40 percent? An academic study4 looked at the specific triggers that have resulted in Australian households being unable to meet their mortgage repayments. 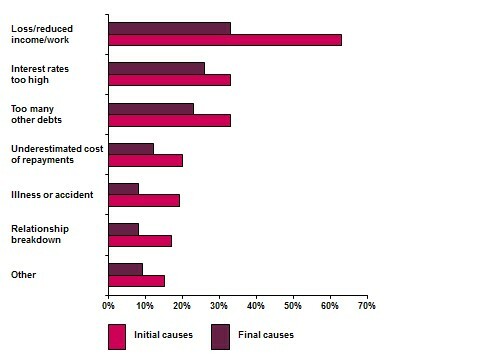 Survey respondents were asked the initial causes and, if they changed, what the final causes were. The graph below shows the results. Loss of work and income: This factor represents the highest risk of defaulting on a mortgage. Understandingly, one needs income to service debt. Taking up mortgage protection insurance can provide some protection. With this type of cover, in the event of involuntary unemployment, the mortgage repayments are covered for a particular period (commonly up to 3 months). These are also usually capped at a specified amount, which may be lower than the actual mortgage repayments. Some Income Protection covers have an unemployment benefit built in, but again, the cover is limited to a specified amount and is only payable for a particular period of time. It is worthwhile, though, considering this feature when looking at obtaining or renewing your Income Protection cover. A better strategy would be to build up a cash buffer that subsequently may be used to cover the period of unemployment. With this in mind, consideration should be given to making additional mortgage repayments that can later be redrawn. 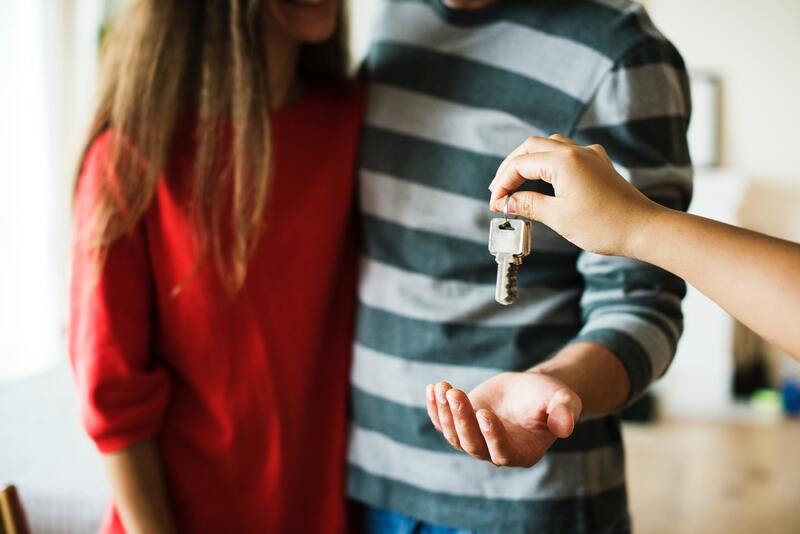 More disciplined individuals with a household budget in place may simply build a cash buffer in a mortgage offset account or have another account or investment portfolio set up that can be accessed at short notice. Interest rates too high: Interest rates fluctuate over time, and this can create pressure on the mortgage repayment capacity. This factor should not be overlooked, as it is the second largest cause in the mortgage repayment issues. Fixing the interest rate on a home loan can provide protection against rising interest rates. The downside is that there are often restrictions on making additional payments into a fixed rate loan, which would limit the capacity to build up a buffer. Many people find a combination of fixed and variable rate loans work best, as additional repayments can be made into the variable rate portion of the debt. A cash buffer discussed above would help to prepare for an increase in the interest rates (and subsequently higher mortgage repayments). A better option would be to allow a buffer for higher interest rates at the commencement of the loan by not borrowing up to the very limit. Too many debts: While some people start with a modest mortgage and manage the repayments well, they may subsequently take on other debts in the form of a car loan or a personal loan; they may also buy some furniture and a state-of-the-art entertainment system, attracted by an interest-free offer. Before long, the level of debt repayments becomes difficult to manage, especially if interest rates or costs of living increase at the same time. Research4 also points out that over 40 percent of defaulting households responded to the initial difficulty in meeting mortgage repayments by using credit cards more often than they normally would. Using debt to service debt is very likely to compound the problem. Also, many people see rising prices of their houses as increasing wealth. In fact, for the most part, such price rises are simply asset price inflation. In reality, most houses deteriorate over time, and require injections of capital to cope with the wear and tear. That illusion has contributed to heavy reliance on mechanisms such as mortgage redraw, thus prolonging the burden of loan repayments and heightening the risk people face in becoming dependent on drawing from a finite source of funds to pay for recurrent expenses. In respect of this, the value of a detailed family budget and cash flow analysis cannot be overestimated. As stated earlier, building a buffer into the estimates to allow for changes in circumstances is also important. Illness or accident in the household: It is important to ensure your income (which is what services your debts) is not compromised due to certain events beyond your control. One way to do this is by having adequate personal insurances. It is also important to address the insurance needs (often overlooked) of the non-working spouse. Income Protection Insurance, which can replace up to 75% of your income if you are unable to work due to illness or injury. This can ensure you are able to continue meeting most of your living expenses, not just your loan repayments. Critical Illness Insurance, which can help you service or pay off your loan and meet a range of expenses in the event you suffer a specified illness, such as cancer or a heart attack. Total and Permanent Disability Insurance, which can help you service or pay off your loan and provide an ongoing income if you become totally and permanently disabled. Life Insurance, which can be used to service or pay off your loan and provide your family with an ongoing income if you pass away. Not many people would deliberately plan for separation from their spouse. It is still good to be prepared for an event like that since this factor is present in nearly 20 percent of the mortgage defaults. Once again, having a cash buffer and being ahead with the mortgage repayments can be of vital importance. When we take a mortgage, our main consideration is usually the burden of immediate repayment, rather than the outlays over time. And because we are optimistic we do not consider risks such as illness or unemployment. Significantly, in the above study4 only 24 percent of households ‘sought financial advice on budgeting and other ways to address the problem’, and where advice was sought, it was often too late to be of use. At the first sign of a problem, it is essential to seek advice, as there may be a range of potentially viable options to explore. Better still, you may want to seek advice before you decide how much to borrow. It makes sense to have a debt management plan in place rather than being forced to take drastic measures, such as selling the house. It is a common misconception that Financial Planners are simply investment advisers. A good adviser can assess your budget and cash flow situation and determine your debt affordability level, as well as assessing your insurance needs. Source: What psychology worth? A field experiment in the consumer credit market. Center discussion paper No. 918. Authored by Marianne Bertrand, Dean Karlan, Sendhil Mullainathan, Eldar Shafir and Jonathan Zinman for the Economic Growth Center of Yale University, July 2005. Source: Understanding human behaviour in financial decision making: Some insights from behavioural economics. Paper to accompany presentation to No Interest Loans Scheme Conference “Dignity in a Downturn”. Authored by Ian McAuley, Centre for Policy Development and University of Canberra, June 2009. Source: Mortgage default in Australia: nature, causes and social and economic Impacts. Authored by Mike Berry, Tony Dalton and Anitra Nelson for the Australian Housing and Urban Research Institute, RMIT Research Centre, March 2010.